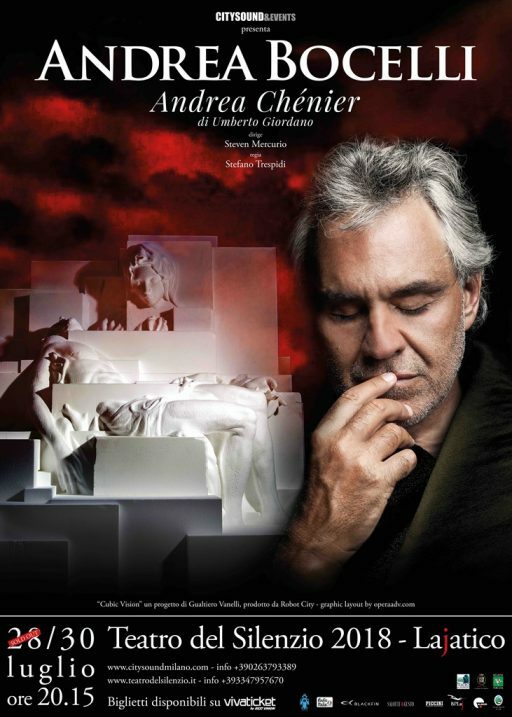 The thirteenth edition of the Teatro del Silenzio, the exclusive event that every year comes to life on the native hills of Maestro Bocelli in Lajatico in the province of Pisa, this year for the first time doubles the appointments that will both be dedicated to the work of "ANDREA CHÉNIER "by Umberto Giordano directed by maestro Steven Mercurio. Directed by Stefano Trespidi, set design by Ezio Antonelli and costumes by Lorena Marin. Andrea Bocelli returns to his greatest passion, proposing the title to which he is most emotionally linked: the first lyrical opera he has listened to and learned in his life, the one he loved most, the one from which the first aria is treated - all 'age of 8 - he sang and fixed in a recording that even today you can hear. Andrea Chénier is the work of love that triumphs, it is the work of "the tenor": the protagonist is in fact almost always on stage and interprets pages that are famous, moving and particularly loved by the public. Like that "One day in the blue space" whose listening (in the interpretation of Franco Corelli) was crucial since the childhood of Bocelli: first spark of a passion and a path of formation that led him to embark on a career of Opera singer. This year's scenography is the great sculptural work "Cubic Vision" by Gualtiero Vanelli.